The Sovereign Military Order of the Temple of Jerusalem Universalis is a direct descendent of the Order revived by Fabré Palaprat in 1804, who has worked under the orders of Napoleon, having Cambaceres as Chancellor of the Order (and of the Empire). Palaprat was also Patriarch of Johannite Church after having been ordained as Bishop in the apostolic succession by Bishop Machaud. Throughout the nineteenth and twentieth centuries the Order had a very troubled history, with most events and practically all leadership essentially centered in France and Switzerland. 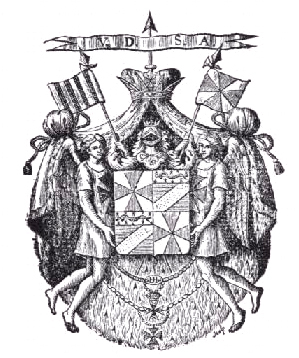 After Palaprat’s death in 1838 the Order was governed by a Regency Council. In 1934 Emile Vandenberg was elected as Regent. At that time Europe was living hard and uncertain times. At the start of World War II, the files of the Order were placed under the guardianship of a Portuguese diplomat posted in Belgium. When the war ended, Regent Vandenberg was involved in a fatal accident and continuity of the Order and of the regency was taken without elections or legitimacy by the diplomat who had been the safe depositor of the files, years before. Different Priories had different reactions to this attitude. Not recognizing the self-proclaimed leadership, various Priories under the initiative of Von Luprecth declared their full autonomy. From 1945 onwards, and for many decades, the Autonomous branch of the OSMTH only recognized national Templar authorities that had been duly elected and whose provenance can be verified. In the 80s the Autonomous Priories constituted the International Federative Alliance with the objective preparing free and universal elections of an International Grand Master. This objective was attained 1999, with the Fr+ Fernando Toro-Garland, former Prior of Spain. He was elected in an universal suffrage verified by external auditors and the Order proclaimed the results of the election after a pilgrimage to the city of Santiago de Compostela. The new Master and his Magisterial Council were installed in office. It was decided to add “Universalis” to the designation of the Order to underline its open spirit and to better distinguish it from other branches. The second elected Grand Master was Fr+ Antonio Paris, former Prior of Italy, installed for the period 2004-2009. He was forced to withdraw for health reasons in 2006, having resumed his term since May 2018. 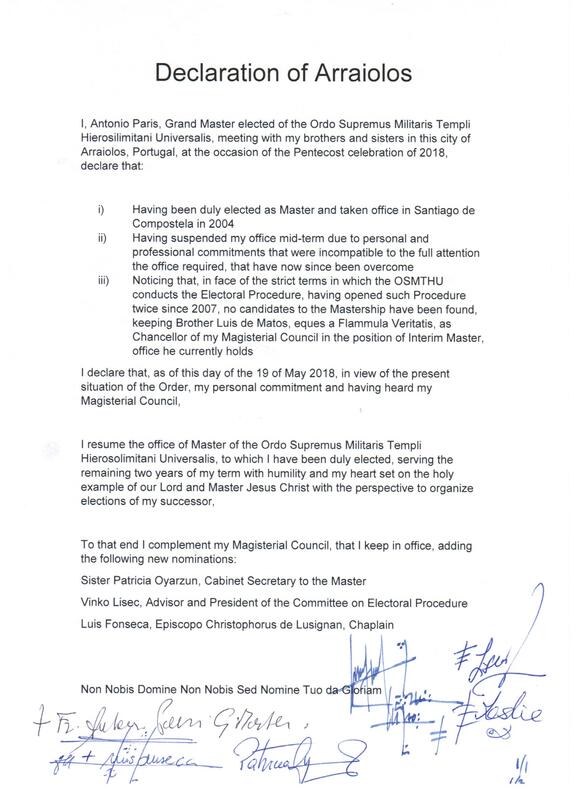 Between 2006 and 2018 the Magisterial Council , under the leadership of the International Chancellor and Interim Master, Fr+ Luis de Matos, former Prior of Portugal, has taken care of the operational, scholarly and diplomatic management of the Order, in a very discreet and modest way, such as the time recommend until the International Pentecost Meeting of Arrailos, Portugal in 2018. During that meeting Master Paris, after consultation with the leadership of the Order, resumed his term. The Declaration of Arraiolos was signed and it can be read here. The official announcement can be read here at the Templar Globe. The OSMTHU does not claim to be direct descendant of the historical Templars. However it proclaims to have an authentic transmission of Spiritual Chivalry, coupled with a reserved expression of the Apostolic Succession under the spiritual authority of a Patriarch. These facts, as well as its history and tradition, place it as a real Order of Chivalric Initiation, which takes its inspiration on the same values and particular history of the Knights Templar, and uses that Tradition and values to instruct and guide their members. The Order endeavors to have a visible presence in the world that may not be confused with any apocryphal expressions of the historical Templars, so common today. It doesn’t seek to stage an anachronistic restoration of the original Order or claim any kind of reparation from the Church of Rome. For these reasons, it takes refuge in a discreet action, appearing in the public light only sporadically. When the times change, so will the methods.